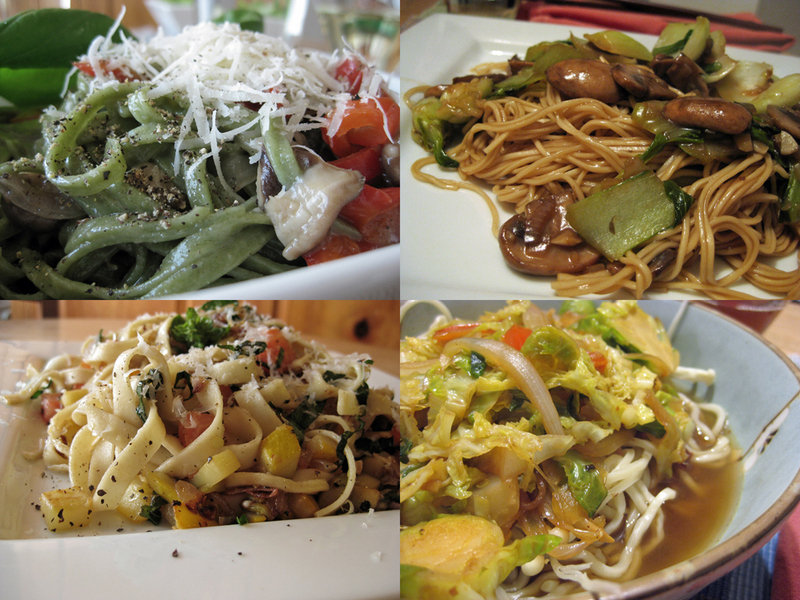 Top (Left to Right) Spinach Fettucini, red peppers and shiitake mushrooms. Asian Noodles with bok choy and mushrooms. Bottom (Left to Right) Fettucini with summer squash, basil and tomato. Asian soup with rice noodles and shredded Napa cabbage. How many times have you come home from grocery shopping feeling hungry, looked at what you just purchased and asked yourself “What is there to eat?” If you purchase bulk items – vegetables, beans, rice – you know, the staples, you always need to factor in some time to prepare your meals from these basic ingredients. Making dishes in large batches and then storing them in meal-sized portions makes a lot of sense and takes the guess work out of weeknight meals. We used to keep soup and other items stored in the freezer for just this occasion, but since going plastic free we have had some difficulty finding a substitution for Zip-loc bags. If anyone has a non-plastic freezer-safe suggestion please let us know. There is always one go-to item that’s easy to prepare, can be made in a variety of ways, and takes less time than heading to the nearest fast-food joint (unless of course you live just above one). I’m talking about pasta! That wonderful, versatile, shape-shifting, flour, water (and sometimes egg) concoction with names like ziti, penne, and spaghetti. With a range of flours and grains used to make this unique and tasty food, everyone can enjoy what has been a staple in so many food traditions around the world for centuries. The invention of pasta is often credited to the Italians but cultures around the world have been making their own version for thousands of years. While debated, the noodle likely made its way to Italy via trade with Arabs in the Middle East. Recent archeology suggests the Chinese were first to the noodle making craft. The Japanese have soba and ramen noodles. The Chinese have chow fun noodles. The Vietnamese have bun (rice vermicelli). In Europe, the Italians aren’t alone in their adoration of the noodle. The Germans have Spätzle which is very pasta-like and takes to a myriad of sauces. With some dried pasta and a few items from your cupboard a wonderful meal can be prepared in the time it takes to cook the pasta. Olive oil, anchovies, olives, capers, lemon zest, and parmesan cheese make a wonderful and salty sauce. Heat the olive oil in a sauté pan, add the anchovies, olives and capers. Mix in the cooked pasta with a little pasta water add the lemon zest and grated parmesan cheese and Voila! You’re eating like an Italian. Want a quick hearty soup? Heat up some broth, add soy sauce, throw in a mixture of equally sized cut vegetables (carrots, broccoli, zucchini, squash, celery, etc. ), and heat until the vegetables are cooked. Throw in some left-over chicken or beef, or even a raw egg or two that will scramble in the broth, then add some cooked soba or ramen noodles, and a handful or two of green leafy vegetable, such as spinach, or watercress. Top with a drizzle of sesame oil and enjoy. If you want soup but don’t want to go the soy route, add savory herbs like oregano, thyme or sage and a bay leaf to the broth instead (dry herbs work just fine here) and toss in a handful of orzo, pan fried broken spaghetti or any short shaped pasta and you’ve got yourself a bowl of something reminiscent of the Mediterranean. With a dusting of fresh chopped parsley and a little extra-virgin olive oil drizzled on top, you’ll think you’ve just plated something special from your favorite Italian trattoria. These aren’t really recipes. It’s called making do with what you have in your kitchen. Be creative and try new things. Read recipes for inspiration and then break the rules. Be fearless! It’s only food after all. Just make sure you eat what you make and don’t be wasteful. A good rule of thumb is that almost anything goes well with pasta, even peanut butter! The peanut noodle recipe that follows is a household favorite around here. The sauce is so simple to prepare but the flavors of the finished dish are rich and complex. We’d take this Asian inspired comfort dish over microwave dinners any night of the week. While pasta is cooking, heat water and add all sauce ingredients to a mixing bowl and stir until sauce is thick but fluid enough to coat pasta. Once pasta is cooked, be sure to reserve some of the water and then drain. Place pasta back into the pan and toss with peanut sauce. Place in bowls and top with cucumber.